How to verify the authenticity of an electronically notarized document via Notarize's secure Verification Portal. Unsure if the document you have received is legitimate? Verifying a document's authenticity is quick and easy. All of our notarizations include not only an embedded audit trail, but also on-demand verification details via our secure verification portal. 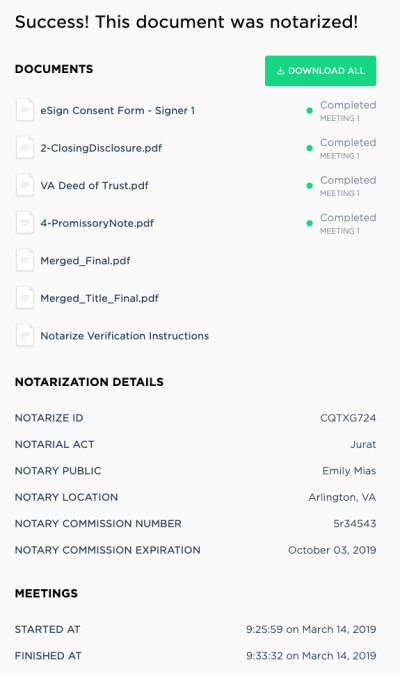 We host the true notarizations via said portal so that you can confirm the state of the document at the time of notarization. Once a notarization has been completed, the signer can send their document to you via email. You will receive an email from noreply@notarize.com with an access link to the verification portal. The body of the email will include the Notarize ID and Access Pin which is required in order to access the verification portal. The signer of the document also has the ability to download and share their recorded audio/video session with the notary. Keep in mind that it is up to the signer's own discretion whether or not they are willing to share the video. Still have questions? Please reach out to support@notarize.com!